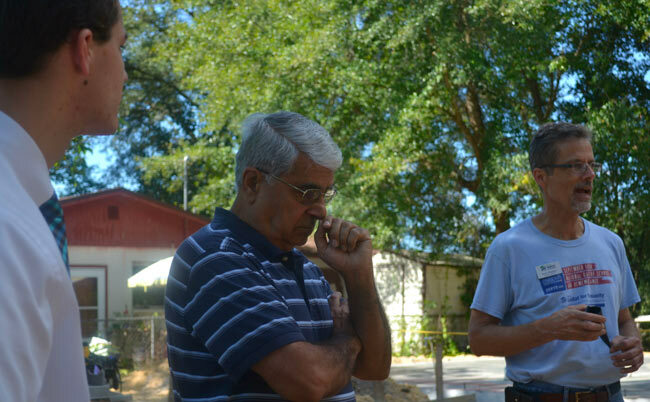 Alachua Habitat's partnership with Santa Fe College's Charles R. Perry Construction Institute facilitates training of construction professionals and assists in Alachua Habitat's mission to provide affordable housing in our community. These Santa Fe houses (as we call them) are built at the college in collaboration with Santa Fe College students and apprentices, the Student Builders Association, Alachua Habitat volunteers, and instructors from the Builders Association of North Central Florida (BANCF) Apprenticeship Program. Home construction at the college gives the students hands-on experience in their Construction Management Techniques I and II courses as part of the established curriculum. The Santa Fe houses are built in two sections and each section is then transported to the home site separately. 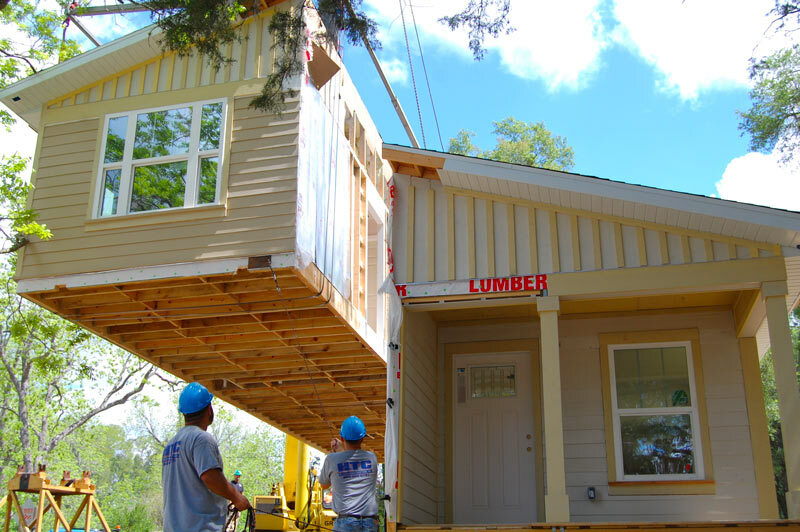 After the two sections of the house are in place, volunteers add a front porch, back porch, driveway and landscaping and address any other issues for final completion. Habitat's mission involves building communities as well as homes. Habitat's interfaith initiative offers the opportunity to extend a hand to our neighbors of other faiths, and to work together to build safe, affordable housing for local families. Our Interfaith Builds are funded and built by members of local faith communities. Aside from new homes built, the positive and meaningful interaction among members of different religions encourages mutual trust, inspires hope, and ensures the sustainability of interfaith collaboration. How can your faith congregation help? Make a donation (cash or in-kind). Donations to purchase materials for the house are needed prior to the start of construction and funds are always needed to help cover the actual building costs of the houses. Contact Scott Winzeler for information about how your congregation can become a full Interfaith Partner. Your congregation can organize a group of volunteers for one or more build days (mostly Saturdays, with occasional additional weekdays available). No experience is necessary! Our construction team teaches you everything you need to know on-site. Contact our Volunteer Coordinator for details. We are always looking for groups to sponsor or provide build site lunches, typically for between 10-25 people. If your congregation is interested in providing, sponsoring, and/or delivering lunches for volunteers at a build site, contact our Volunteer Coordinator for details. Tell your missions and outreach committees, congregation leaders, and fellow congregants about this unique opportunity! we can't wait to build with you! UF Habitat for Humanity Campus Chapter is made up entirely of UF students. The UF campus chapter takes the lead role in building, organizing volunteers, and providing lunches for one or more Alachua Habitat build sites.